Dog pregnancy is a natural condition, and in the wild it's something that dogs are well-equipped to handle without our help. But our pet dogs aren't wild. They rely on us for the basics like food, shelter and veterinary care, as well as love and attention. You're going to be sharing this pregnancy with her, and the labor/delivery and puppy care too... and it will be easier for everyone if you both know what you're doing! Personally I believe in two things when it comes to breeding dogs. The first is that purebred dogs should only be bred as part of a well-thought out breeding program where all dogs have passed genetic and health testing appropriate to their breed. Secondly, that mixed breed dogs have a valuable place in our world, but that they should only be bred if both dogs are 100% healthy, the owner can afford all necessary vet care (including emergency C-section etc.) and that good, loving homes are already lined up for all the puppies. Pregnancy and whelping may be natural procedures, but things can go wrong and put both momma and puppies at risk. Veterinary attention isn't cheap, so make sure you have the funds available for emergencies. 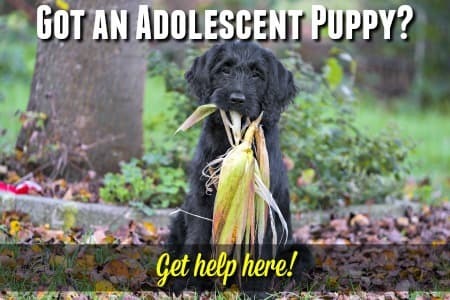 For both purebred and mixed breed pups there's one more thing.... if the owner can't find permanent, suitable, loving and knowledgeable homes for the puppies then they must be willing and able to keep those pups themselves, permanently if necessary. When you consider the huge problem of stray/unwanted/neglected/abandoned and mistreated dogs around the world, you can see immediately why indiscriminate breeding is NOT a good idea. Left to her own devices, and unassisted, a female dog in season is very likely to get pregnant by any un-neutered male who finds her.... and she's perfectly capable of having her eggs successfully fertilized by more than one dog. So, you need to keep your in-season female well away from any suitors or stalkers (other than her chosen mate), for a full three weeks from the first sign of blood loss. Although every dog is different, the general rule-of-thumb is that your dog will be ovulating somewhere around the tenth day of her cycle. But she could well be a day or two early, or a day or two late. So you need to plan several 'couplings' over a five or six day period. Most females won't be too interested in allowing a male to mount them until ovulation is imminent, but again, they're not all the same! Your girl may welcome her suitor from day one, or fight him off all the way through the ovulation period. There's no telling in advance how this will work out. Meanwhile don't let your dog outside (even in a fenced yard) unsupervised, even for ten minutes. She may reject the mate you've selected for her, but if some random dog catches her eye (even through a chain-link fence), don't underestimate their ability to mate successfully while you're not looking! It's not a good idea to breed a female who is less than eighteen months old, or during her first heat cycle. There's a higher risk of complications with dogs who are too young or not fully mature, and they also have a tendency to be poor mothers. Pregnancy in dogs lasts approximately sixty-three days.... calculated from the day of ovulation. Although you can't see exactly when your dog ovulates, I'd recommend estimating that to be Day 10 of her heat-cycle. As with human pregnancy, this is just an estimate. Some mom's will deliver a little early, others a little late. Some will hit the nail right on the head. But with dogs, we're talking about a variation in days, not weeks. From roughly day fifty-eight, to day sixty-five, be on standby for the arrival of puppies. It's pretty easy to get an idea of when your dog will deliver her puppies by counting sixty-three days from day ten of her heat cycle and seeing where that falls on the calendar. However, you can use a dog pregnancy calculator if you're in a hurry. To begin with there's really very few signs that your dog has been successfully mated and is pregnant. Some dogs MAY seem to lose their appetite soon after their season ends, or even vomit a little now and then during the first two or three weeks. Or they might act a little differently - more mellow, or affectionate. Or maybe extra grumpy or sensitive. But this can happen in dogs who haven't been mated too. There isn't a home pregnancy test for dogs the way there is for humans. Human pregnancy test kits will NOT work on your dog because dogs don't produce the hormone HGC which is what these tests are measuring. There is a dog pregnancy test which involves looking for the hormone Relaxin in your dog's blood. It can be done somewhere between 22 and 27 days after you dog's last mating. Although it is possible to but this test online, it needs to be done by your veterinarian because you need a blood sample and a centrifuge to separate the plasma from the other blood components. Relaxin is not produced in a dog with false pregnancy. It's several weeks before you can SEE the first visible symptoms of pregnancy in dogs (and these could also happen in a 'False Pregnancy', so even then, no guarantees!). The most noticeable signs of dog pregnancy happen around the fifth to sixth week. This is when her teats will start to swell, and she may begin to look a bit 'thick' around the middle. Your vet can confirm dog pregnancy with a blood test (as described in box above), sometimes as early as twenty-two days after the last mating. 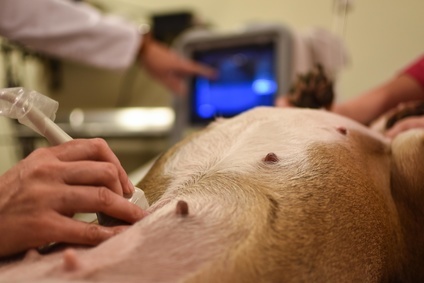 An ultrasound can also pick up the puppies heartbeats, sometimes as early as eighteen days. There's also a very short window of time in which your vet may be able to feel the puppies in your dog's womb. This happens between Day twenty-seven and Day thirty-one. X-rays are most likely to be useful for diagnosing or ruling out potential problems during the last three weeks of pregnancy. During the last week or two there will be little doubt that your dog is pregnant! You'll be able to see/feel the puppies moving and if you have a stethoscope you should also be able to hear their little heartbeats racing along. 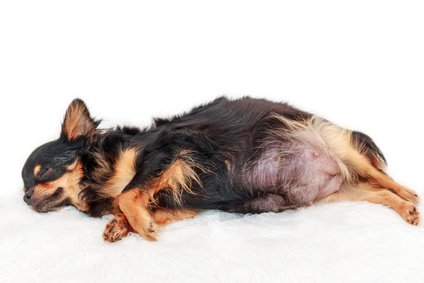 Your dog is pregnant for only eight weeks, but a lot happens in two months. From a single cell, to a fully-formed baby dog. This is the very beginning of pregnancy and starts with fertilization of the eggs. Cells begin to divide into individual embryos and these tiny bundles of cells move towards the uterus. Embryos embed themselves into the lining of your dogs' uterus. They start to take nutrients from their mothers' body. Embryos are now fetuses and begin to take on some recognizable shape & form. This is the most crucial time of fetal development. Fetuses now look like puppies. Sexual characteristics are in place. Less risk of developmental damage. The puppies skin pigmentation and coat begins to form, as does their bone structure and skeletal frame. Puppies are now fully developed and focused on growing bigger & stronger. The puppies are almost birth size now and are probably feeling crowded! For the first four weeks or so of your dogs' pregnancy things putter along pretty much as usual and the momma-to-be doesn't need any special treatment as long as she is normally well cared for. A reasonable amount of gentle exercise will help keep her healthy and strong... and she's going to need that not just to get through her pregnancy, but for the delivery and the following weeks of puppy care duties! Don't go overboard on the exercise though. Simply maintaining her daily walks and games is fine in the early weeks. Later on, she's not going to feel like running or jumping, but walking is just fine. If your dog didn't get much exercise before she got pregnant, now is the time to begin. BUT take it slow and easy, and ask your veterinarians' advice before getting started. ... before you're even sure whether or not she's pregnant ). Your dog needs a premium food so that her nutritional needs are met, as well as those of the possible puppies in her womb. She needs lots of water to keep her hydrated and her organs working properly. You don't give her any medications that haven't been approved/prescribed by your vet (and that he/she is aware of the possible pregnancy). You don't use any flea/tick preventatives on her without checking with your vet first. Don't allow her to be vaccinated. Towards the end of the pregnancy Fifi is most likely to be heavy and tired, but restless too. She may become a suddenly fussy eater. She needs her nutrition though, so it's okay to add some home-cooked 'extras' such as organ meat, eggs or chicken. Or cottage cheese.. But don't overdo it, she should be getting the bulk of her nutrition from her high-quality dog food. During the last seven to ten days of pregnancy, your dog is likely to start showing signs of her inborn 'nesting instinct'. This is when you need to set up her whelping box/area/room and encourage her to rest there. If there's nowhere being readied for her she may end up trying to have her newborn puppies behind the sofa, under the bed, or in some equally inappropriate and inaccessible spot. This page focuses on your dogs' pregnancy and I'm not going to cover whelping (aka 'labor') and delivery of the puppies. It's a good sized subject and I think you would be better off reading all about it in more detail - that way you'll be able to help your dog through it (if/when needed) and be prepared for any emergencies. So here are some of the very best books which cover dog breeding in comprehensive detail as well as whelping and delivery. I strongly recommend adding at least one of them to your bookshelves well before your dog embarks on her pregnancy. 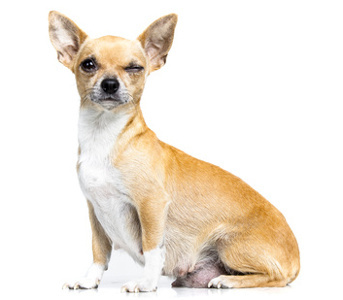 Any female dog who has had her heat-cycle recently is a potential candidate for a 'False Pregnancy' - whether or not she's actually been mated! This condition is caused by an overreaction to the normal hormone changes which happen during a dogs heat cycle. It can confuse everyone because the signs of a pseudopregnancy (the formal name for this condition) are pretty much the same as the signs of a real pregnancy... except there are no puppies growing in the dogs' womb. In a false pregnancy there are often no early signs that something is going on inside. But somewhere around six to eight weeks after ovulation she may start to gain weight, show personality changes, her teats may enlarge (some dogs even produce milk), she may seem tired and have fluctuations in appetite. Often a dog will have a strong 'nesting' instinct, and as no puppies are produced they may take to carrying a pretend puppy around with them, and mother it too. We have an Olde English Bulldogge who has gone through this, and she would collect up soft toys, slippers, socks and anything that seemed even remotely puppy-ish to her hormonally-confused brain. This is sad to see and upsetting for dog and owner, so it's important to find out whether Fifi really IS pregnant or not. Only your veterinarian can diagnose pregnancy with any sort of certainty, so it's a good idea to have him examine your dog when she starts showing pregnancy symptoms (if she hasn't been mated) or if no puppies appear by Day 63 (if she has been mated). 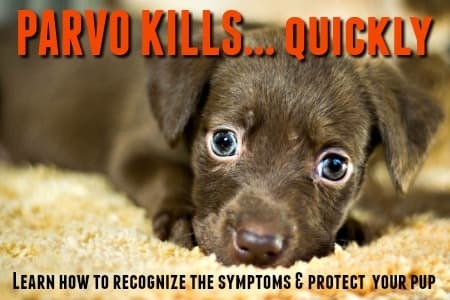 Although it's stressful for everyone, generally there's no treatment needed for this situation and over time your dogs' hormone levels will return to normal and so will her behavior. Sometimes not allowing her to 'mother' soft toys and so on, and disrupting her nest-building attempts can help speed up this process. I know from experience that this is difficult to do, but it's being 'cruel to be kind'. 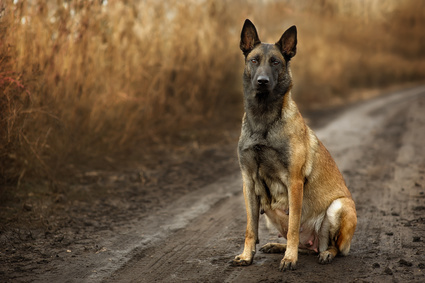 If your dog experiences a false pregnancy, talk to your veterinarian about it and ask for advice. There are treatment options available for severe cases (eg. a dog won't stop lactating or is having real emotional/physical problems as a result of the pseudopregnancy). Any female who goes through this once has a good chance of doing so repeatedly. So if you don't intend to breed her, the best long-term choice is to have her spayed as soon as all signs of the phantom pregnancy have disappeared.